An adrenaline-packed ride to save the world from a conspiracy straight out of the darkest hours of history. Are Hitler’s atrocities really over? Present day. After another late night with yet another woman whose name he doesn’t remember, self-pitying golden boy trader Jay Novacek learns that his long-lost father has died, precipitating events that lead him to board a plane to Zurich. He’s got a Nazi medallion in his pocket, a hot CIA bodyguard next to him, and a clearly dangerous Mossad agent on his tail. What was his father investigating? Why was his mother assassinated? Far from his posh apartment, he races to save the world from a horrific conspiracy. Can it be stopped? Over 130,000 copies sold in France. "Pace... high interest... emotions... surprise ending." —To Read Or Not To Read is Not a Question. 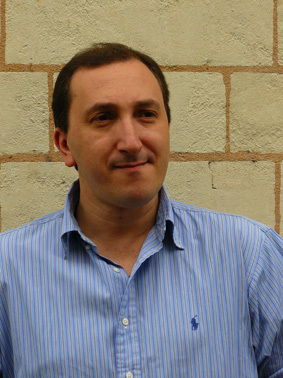 French author David Khara, a former journalist, top-level sportsman, and entrepreneur, is a full-time writer. Khara wrote his first novel—a vampire thriller—in 2010, before starting his Consortium thriller series. The first thriller in the series, The Bleiberg Project, was an instant success in France, catapulting Khara into the ranks of the country’s top thriller writers. Find out more about David Khara. Simon John was born in the United Kingdom. After graduating from Cambridge University, he stage-managed and produced theatre for two years. A quest for wine, women and goat cheese led him to Paris, where he began working in film production and translation. by David Khara; translated by Simon John — published by Le French Book — ISBN: 978-0-9853206-9-0 (Kindle) / 978-1-939474-99-5 (epub) / 978-1-939474-06-3 (trade paperback — First published in French (Le Projet Bleiberg, Les Editions Critic) — Direct-to-digital translation; e-book release date: April 30, 2013; trade paperback release: July 15, 2014.